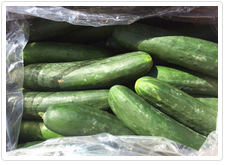 Ottawa, September 9, 2015 - Industry is recalling field cucumbers and any in-store produced products that contain field cucumbers purchased from the listed retail stores due to possible Salmonella contamination. Consumers should not consume the recalled products described. This recall applies to fresh field cucumbers sold in bulk, unwrapped and any in-store produced products that contain field cucumbers purchased from the listed retail stores on or before September 8, 2015. Consumers who are unsure if they have purchased affected products should check with their retail store. The following products may have been sold from the following stores in Ontario, Manitoba, Saskatchewan, Alberta, British Columbia, and Yukon.